Bittersweet Enchantment: Book Blitz: The Torc by J.E. Hunter + Giveaway! Book Blitz: The Torc by J.E. Hunter + Giveaway! BOOK BLITZ for The Torc by J.E. Hunter! Aurora Daniels has just finished her first year of university and is ready for summer fun when she meets Garret, the mysterious older brother of her best friend, Ivy. Garret isn't what Aurora expected, yet her connection to him is undeniable. But something lurks beneath Garret's charming exterior, a danger that Rory isn't prepared for. As Rory spends more time with Ivy and her brother, she grows closer to Garret, until the undeniable attraction turns into something more. But a relationship with a cursed soul isn't simple. As Garret's mysteries are slowly revealed, Rory learns that she isn't all that Garret wants. He wants something else, too. Something that would mean giving up her family and her future to undertake a dangerous journey through a land lost in mist and fog. A journey that will change her life forever. A journey that might lead her to her grave. My iPhone directed me to Ivy's place. There was a long gravel drive leading off the highway in the direction of the river. Just as I spotted the house in the distance, I came upon a gate. The gate was made from black wrought iron, affixed on both sides by short brick walls. The gate and wall wouldn’t have stopped anyone from gaining access to the property if they really wanted to, but it looked nice. Official. The gate was open and I drove straight through, past rows of small hedges. Beyond the hedges were fields of green wheat. I knew that Ivy and her brother weren’t farmers, but they owned all of the land surrounding the estate and rented it out to farmers, keeping only the house for themselves. The house was built well away from the river valley—which I could see curving off in the distance—to ensure that it was built on a solid foundation. As I approached the house, I sucked in a deep breath. Two stories, bricked exterior—which was practically unheard of in the prairies—and lots of large, bright windows. The brick was grey and the shingles were black, and the porch was small and held up by two columns bricked in the same material as the rest of the house. I pulled up in front, driving around a small, circular roundabout of baby pine trees that weren’t even close to the giants they would be one day. There were a few groups of bushes in the distance, and a bright green, manicured lawn around the house. Ivy ran out the front door—a broad, black thing—with a gorgeous smile on her face. "Welcome to Chateau Creepsville!" she said as I stepped out of the car. The sun was bright and hot, but the house was like a dark spot in the middle of a spotlight. I'd never seen a house like it before, except maybe the one time my parents had taken me to the United Kingdom. The house was entirely out of place on the prairie, and would have fit in much better somewhere near York—the city I’d visited with my parents. “Yeah, some crazy old guy built it. Garret got it on sale. I don't think anyone else wanted it on account of the ghost." Ivy laughed when I looked her. "Don't worry," she said with a wink, "I'm sure it's a friendly ghost. Leave your car here, Gil can move it later." Ivy pulled opened the back door of my car and loaded her arms up with my stuff. I opened the other side and grabbed my suitcase while nursing my latte. "Who's Gil?" Ivy frowned. "I haven't mentioned him? Well, he's our butler, for lack of a better word. Though maybe you would consider him Garret's personal assistant?" Ivy ah-hummed as she stepped into the house. The entrance was grand. A black and white checkered floor filled the space between two staircases, one running up each side of the foyer. A chandelier hung from the double height ceiling above. There was a decorative table to my right with a mirror hung above it and fake plants set on top. Not the tacky kind, but the expensive kind that you had to touch in order to know if they were real or not. Ivy led me up the staircase to my left. It was covered in plush, heavy carpet that was so clean I thought it might never have been stepped on. It had a Persian rug-type design of deep red and golds, which complimented the white walls with their black trim. It was the kind of house you'd see in a designer magazine. The decorations were slightly eccentric but came off as totally stylish. Not that it was a house, really, but more of a mansion, or an estate. Was there really any difference? No matter what word I used, the house would still be enormous. Up the stairs, the air was crisp and smelled like tropical waterfalls. Plenty of natural light poured in from the open windows. On the second floor, Ivy again turned left. We passed two open rooms, one on each side. The first was a library, filled wall to wall with books. A solitary writing desk was placed directly under the window and in the centre of the room were two armchairs facing each other. The second room was a home gym complete with a pilates machine. At the end of the hall was a large bathroom, with a glittering, white marble floor. "This is my room," Ivy said, indicating to the left. Her door was open, displaying a perfect room complete with canopy bed and lilac purple carpet. There were deep purple curtains and a leather chaise in the far corner facing a wall-mounted television. "I've decided you should be in this room," Ivy said, opening the door on the other side. It swung open, revealing a space so blue that I felt like I was underwater. All the walls were a deep, royal navy colour, but the bed was so white and soft looking that it could have been a cloud. There was a papasan chair tucked into the corner, and a small dresser, also white, under the window. "It's gorgeous!" I said, rolling my suitcase into the room. "I feel like I'm staying in a hotel, not at my best friend’s house." "I hope it feels a bit more homey than that!" Ivy said, a touch of sadness in her voice. "Definitely homier," I said with a smile. Ivy walked over to the bed and sat down, crossing her legs underneath her. Her jean shorts and blue t-shirt matched the room, but the pink streaks she must have painted in her hair that morning did not. "Thanks again for inviting me," I said. "I didn't realize how it would feel to drop my parents off at the airport. I thought I would be more excited but..."
"You felt a bit abandoned?" Ivy suggested when I didn't finish my sentence. "I get it," Ivy said. "Come on. Leave your stuff here. I want to show you the garden." I followed Ivy back downstairs. We didn't go to the west side of the second story, since Ivy said that was where Garret was sleeping. I bit my lip, wanting to meet this mysterious older brother. The one who had raised Ivy since the death of their parents when Garret was seven and Ivy was a baby. Someone must have looked after them before Garret was of age, though it had never occurred to me before. Ivy might understand my current emotional state, because her past had been much worse. My parents were just going on vacation. I couldn't imagine how I would feel if they never made it back. From the foyer, we headed to the back of the house and into a bright, spacious kitchen. Cast iron pots hung from the ceiling and deep wooden counters stretched along the walls. I was startled to see an older gentleman cutting up a flank of meat. He looked up and caught me with two sharp, dark eyes. “Ah, our guest has finally arrived.” He spoke with a slight accent that sounded upper class—surprising for an assistant. The man placed the long, sharp knife he was holding down beside the raw flesh, and slipped off a blood-splattered glove to hold a hand out to me. He was much taller than I was, which was surprising since I was nearly five-foot-nine. He only smiled with one side of his face, and his eyes remained dark, assessing. “Aurora, this is Gil, Garret’s assistant. He does most of the cooking.” Ivy indicated the man who could have been anywhere between the age of fifty and seventy-five. She didn’t look at him, however, but stared past him at the set of French doors at the back of the kitchen. I was frozen, a little appalled at the idea of taking the hand that had been so recently butchering meat. I reminded myself that he’d been wearing gloves, and shook hands with him to be polite. “It’s nice to meet you,” I said. Gil tilted his head down toward me. He was thin, but rigid with sinuous muscle. He had shallow cheeks and short grey hair. “It’s a pleasure, of course.” He spoke slowly, his voice was deep. “We’re just going out to the garden.” Suddenly, Ivy was at my side, pulling me toward the sunlight streaming in through the open doors. When had that happened? I felt strangely disjointed, like I’d been staring too long out a window, lost in thought, when I’d only just spent a second shaking Gil’s hand. “I’ve put the recliners out by the fountain for you and your guest.” Gil half-smiled at me again. I looked away, a unsettled tingling in my lungs. “There’s a carafe of sangria out there, too, and some snacks, since supper won’t be served until nine o’clock, as per your brother’s instructions.” Gil slipped the glove back on and went back to chopping the meat. I stepped out of the kitchen and into the sun, but still I shivered. It was warm enough that I would need a generous layer of sunscreen to keep from burning, but I felt chilled, and decided to forget the lotion for the moment. I warmed up quickly enough as Ivy led me through a waist-high maze of hedges, back toward a large, circular fountain. There were rose bushes around the edges of a small gravelled area, a few choice sculptures of cherubs, and two lounge chairs, just as Gil had said there would be. There was also a pitcher of sangria. “Gil mixes drinks for you?” I settled into the chair furthest from the house. Out in the country, it was quiet. The prairie sky was blue and peaceful. A few birds chirped from the hedges, and there was the slight burble from the fountain, but that was it for noise. The sounds succeeded in chasing away any lingering feelings of uneasiness. Ivy laughed and gave me a naughty look. “Of course. Gil does everything. Personally, I could have gone for margaritas, but sangria will do. Before my brother forced me to move here, I was living in Spain. Everyone drinks sangria in Spain. At least, everyone I know does.” Ivy poured me a goblet full of the deep red liquid, and I took a generous sip to steady my nerves. I’d expected Ivy to come from money, she’d never hid that, not exactly. But I hadn’t expected her house to be an amazingly decorated gothic mansion. I laid back in my chair and looked up at the house. I could only see the western half, and the window I imagined was Garret’s. He was six years older than Ivy and a complete mystery. I couldn’t wait to meet him. J.E. Hunter lives in Saskatoon, Saskatchewan, and began writing as an excuse to stay inside during the cold winters. Her favorite season is the fall, and her favorite hot beverage is currently a peppermint mocha. Most recently, J.E. 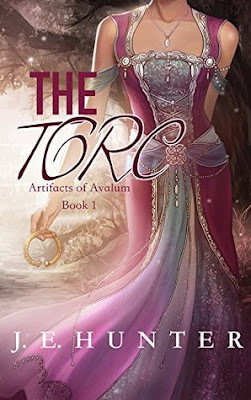 Hunter released The Torc, the first book in the Artifacts of Avalum romantic adventure series. She is also the author of the Black Depths Series, which consists of five books, beginning with Sea-Witch. 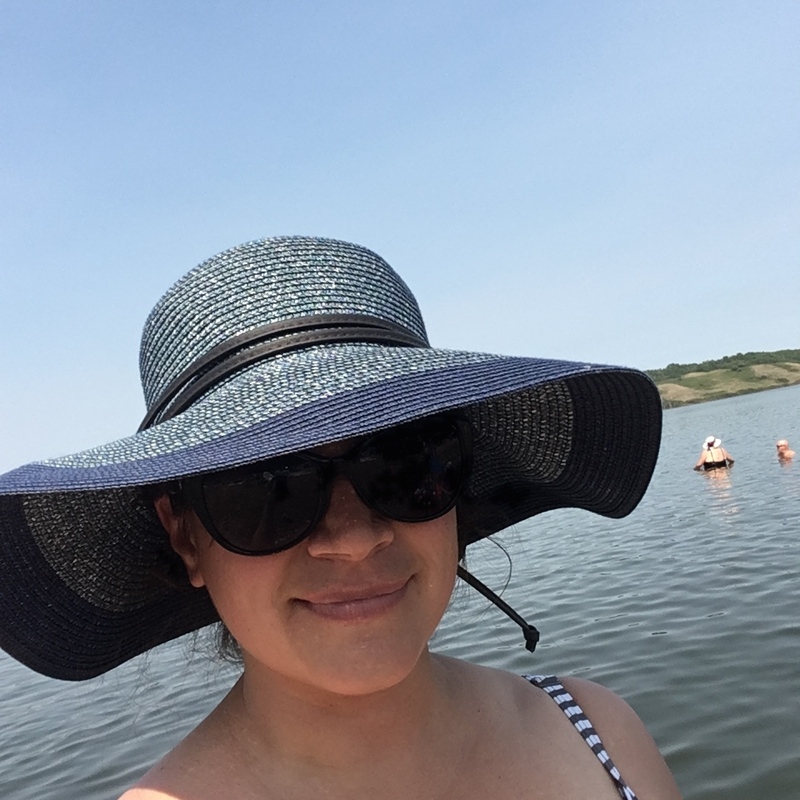 When not writing, J. E. Hunter can be found reading, walking through spooky woods, drinking coffee and coloring books, or listening to audiobooks at the gym.